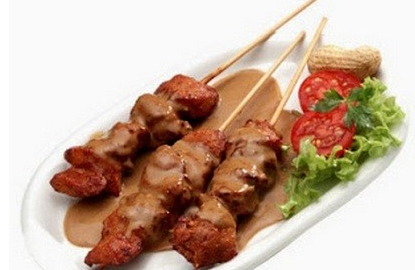 Recipes How to Make Fried Beef Sate Practical -In making satay, usually the meat used is mutton and chicken. However, did you know that, the beef was not less delicious when made into tablets satay, especially ahead of Eid al-Adha, beef stock will accumulate nih hehe: D. Rather than later confused diapain stock flesh, there is no harm if made into fried skewers of beef, as well as to test how the hell it feels when processed into beef satay haha: D.Penasaran want to know what it feels like and how to make it? let's see Recipes How to Make Fried Beef Sate which we review below. Heat the oil, and then enter the fine material peanut flavor (hazelnut, garlic, onion and red pepper) and then stir-fry until it feels harum.Setelah immediately enter the land that has been mashed beans and water. Then cook until boiling and mengental.Kemudian add pepper powder along with salt, soy sauce and stir until evenly distributed. The first step, boiled beef to be tender, then drain. pepper, salt, butter and cooking oil, then stir well and let stand for about approximately 10 to 15 minutes. After that the beef skewers (it could be without stabbed and directly fried) by using skewers that have been prepared beforehand. Lastly, Heat the oil in a pan, then enter the satay beef to the pan along with the seasoning, then fry with a small dose of the fire until the meat out of the water. Until water fried meat shrinks and looks rather dry and oily. Then, remove the skewers and serve your homemade fried beef with spices nuts. 0 Komentar Untuk "Recipes How to Make Fried Beef Sate Practical "